What on Earth is a video slot game from Microgaming. Prepare to take off with this game and meet the aliens and learn a secret or two for our Planet Earth. Join the team “Alien” and abduct as many riches as you can from humans of the Earth. What caught our attention in this game is the watermelon. It is so big that it comes with a set of 3 Moons of its own. It turns out that this game has some fruity looking cosmic bodies, not only aliens as we mentioned before. What on Earth features a wild symbol and 3 different scatter symbols. The wild here is slightly different in its function than in other Microgaming slots. Namely, it substitutes for the alien character and the control panel symbol. The scatter symbols offer a scatter payout which is not that big, but money is money after all. The good thing here is that they activate 2 bonus games. 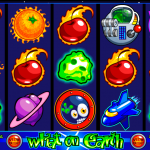 In the “Beam`em Up Bonus” round you need to choose one alien to send on Earth to abduct 1 of 13 characters for a multiplier that is later applied to the amount you have won in the previous spin. The destination bonus will take you to a city of your choice and abduct a character that is native to the given city. If you find the right character you can win x 400 multiplier. With What on Earth game, Microgaming is taking us on a journey where we can explore our universe. Powered with bonus rounds and special symbols this game will make your heart skip a beat every time you trigger one. The straightforward game play is a great addition and will attract players of all levels. Japanese cuisine is not only awesome it is also a slot game: Wasabi San a 5 reel slot by MicroGaming.